Never Lose The Remote Again With The Zero Gravity | OhGizmo! By Andrew Liszewski on 10/30/07 • Leave a comment! First off I don’t think the creators of the Zero Gravity really have a grasp on what the term ‘zero gravity’ means. In fact their product seems to completely rely on the presence of gravity, otherwise it would be a pain to use. 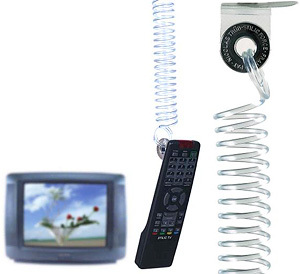 The basic idea is to tether items that are easily lost, like your TV remote, to a coiled cable hanging from the ceiling. When you need to use the remote you just reach up and pull it down. When you’re done, you just let it go and it retracts back up, ensuring it’s always in the same place you left it. When uncoiled the cable stretches as far as 5 meters, but depending on how much elasticity it has you might want to be careful when letting go of that remote. The Zero Gravity is available from LeDindon for about $25.